This is an elementary property which is measure of ability of a material to inhibit to conduct electric current. In SI unit electrical resistivity is Ω-m (ohm-meter). 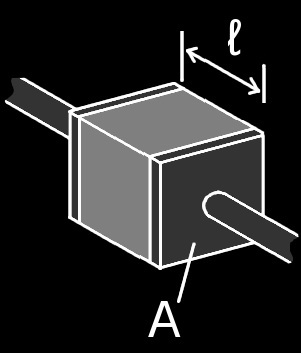 If a cube of 1 m3 (each side is 1 m) has sheet contacts between two opposite sides having resistant between them 1 Ω, the resistivity of that materials is 1 Ω-m. This property is the inverse of electrical resistivity. In simple word, electrical conductivity quantifies ability of a material to flow electric current. It is an ability of materials to transfer ions through it under the action of electric filed. Every material has more or less conductivity. When conductivity is very low in any material, we termed it as an insulator. But no generalized comment can be made about concrete, as its electrical conductivity depends on many factors. • Moist concrete acts basically as an electrolyte that has resistivity of ≤100 Ω-m, can be said as semi-conductors. • Air-dried specimen was found to have resistivity of the order of 104 Ω-m.
• But an oven-dry specimen of concrete has resistivity of around 109 Ω-m, this value lies within the range of good insulator. Under the general operational conditions, concrete exhibits a high resistance to flow of electric current from or toward embedded steel. The main cause behind this behavior is an electro-chemical action that concrete produce on reinforcing steel at the contact interface. The alkaline behavior of electrolyte exist in the concrete offer this property to concrete. This protection against current flow applies within the voltage range of around +0.6V to -1.0V as compared to copper sulfate electrode. The electric current is primarily regulated by polymerization effect rather than ohmic resistance of surrounding concrete. Cement substitutes usually replace a small fraction of cement (usually 30-40%) based on the function of concrete. Whatever the fraction of cement substitutes, they usually increase resistivity. When ground granulated blast furnace slag is used in concrete, it results gradually increase in electrical resistivity as compared to concrete contain only Portland cement. Silica fume also shows increase in resistivity. Both silica fume and ggbs are significant when ongoing corrosion process of embedded reinforcing steel is regulated by electrical resistance provided by concrete. Presence of chlorides in pore water, similar to other ions, significantly reduce the resistivity of both mortar and cement. For the former, a reduction of 15 fold was reported. The source of chlorides in pore water is saline mixing water. The influence of salinity in mixing water is greatly enhanced in concrete having high water/ ratios Water-cement ratios and consequently less significance in high strength concrete. A freshly mixed concrete has low resistivity which will increase at a very slow rate up to first few hours after placing. Then resistivity increases rapidly up to the age of 24 hours. After that it increases with reduced rates or sometimes become constant until concrete become dry. Dry concrete has good resistance. When the term aging is used, it includes long time after hardening of concrete, the capacitance of it reduces with age and increase in frequency. When compared with neat cement paste, a concrete with water/cement ratio of 0.49 has lower capacitance than neat cement pate of water/cement ratio of 0.23. When concrete is immerse in sea water and subjected to wetting and drying cycles, a thin layer of calcium carbonate and magnesium hydroxide are formed on surface. This layer can greatly increase resistivity of concrete. When this layer is taken out, the natural resistivity of concrete (when stored in fresh water) will be restored. In general, admixture do not decrease resistivity of concrete, but some intentional inclusion can change resistivity based on the purpose of concrete structure. As an example, addition of finely divided bituminous components followed by special heat treatment at 2800 F (1380 C), was found to be useful to improve resistivity of concrete, especially in wet conditions. Conversely, when static electricity in concrete is not desired and reduction in insulation resistance is required, by inclusion of acetylene carbon block by 2~3% of cementitious materials, a fairly good result can be achieved. When electric conductivity of concrete is expected, fine aggregate can be replaced by conductive fine aggregate. Grinding nearly pure crystal of carbon (which is available as proprietary product). When resistivity lies between 0.005 to 0.2 Ω-m; the important properties of concrete including compressive strength are not found to be altered significantly. Resistivity of concrete reduces with an increase in ambient temperature. Regarding voltage of the system, resistivity increases with increase in voltage. Figure 2 describes this relation; test conducted on an oven-dry specimen dried in desiccator not permitting absorption of moisture. The maximum reference provided so far in the above sections are based on alternating current (a.c). The resistivity of concrete to direct current (d.c) may not be the same as It is influence by polarization effect. At 50 Hz, resistivity of concrete to a.c and d.c almost same. Generally a concrete member that is matured in air, impedance of it is approximately equal to d.c resistivity. It is interpreted by Hammond & Robson to show that resistance in concrete is so much smaller than capacitive reactance of it that only former contributes to impedance significantly and power factor is close to unit. Typical data sheet of alternating current is shown in Table 1. 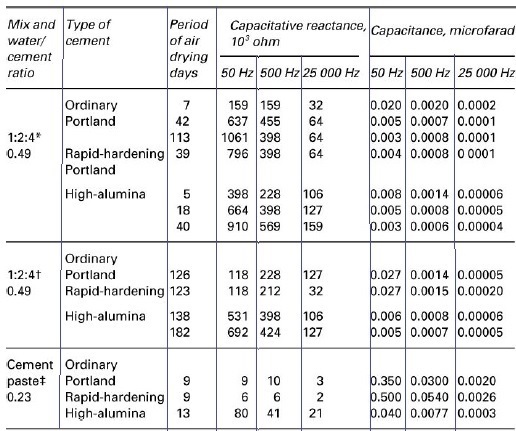 Table 1: Typical Values of Electrical Properties of Concrete..Contd. Two forms of water present in concrete; in early stage there have evaporable water which is removed throughout the process of gaining maturity and the next one that has to be considered in electrical resistivity is gel water. Resistivity of concrete is increased significantly with the removal of evaporable water. Electric current uses electrolytic means to conduct through concrete having moisture. But when capillaries are not continuous, electric current passes through gel water. For a particular concrete of defined mix design, drying out in air decrease electric conductivity at the surface zone. 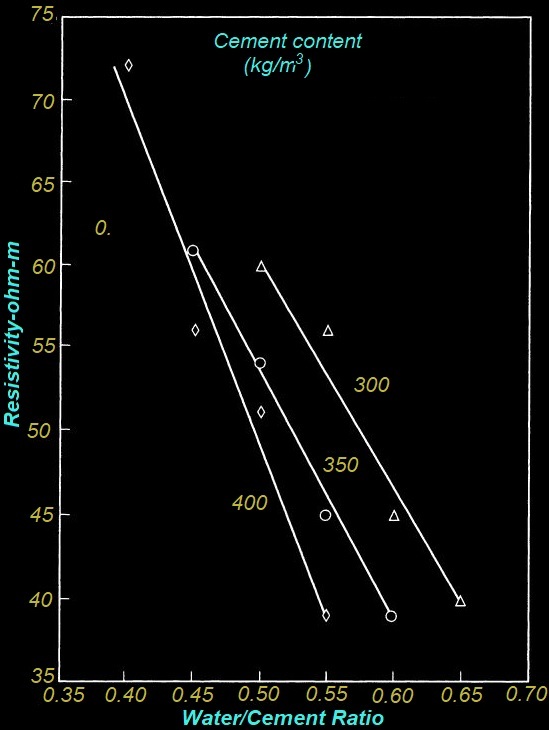 As an example Tritthart and Geymayer reported that resistivity of a concrete having water/cement ration of 0.50 increase eleven fold which was found even more at higher water/cement ratio. Thus it is expected that increase of water of any amount and increase in content of ions exist in pore water, reduce resistivity of cement paste; actually a sharp decrease in resistivity is found with increase of water/cement ratio. 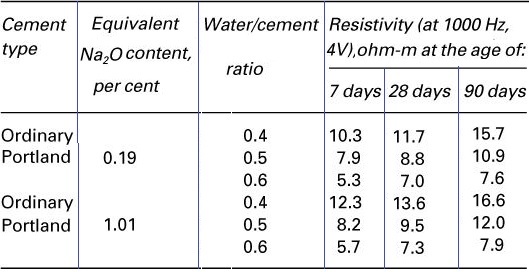 Table 3 and Figure 2 have been presented below showing relation between resistivity and water/cement ratio for hydrated cement paste and for concrete. This relation can be established by the laws of conductivity of homogeneous materials. In the usual mix design that are proposed for concrete construction considering both strength and durability requirements have not much options to vary water content for a selected aggregate grading and requirement of workability i.e. resistivity is now more dependent on cement content. The chemical composition and content of cement controls availability of ions in the evaporable water. . So the sources of ions in water may be cement and water itself. Thus cement type and content both have influence on resistivity. In normal construction practice, decrease in cement content in mix results resistivity of concrete to increase as for a constant water/cement ratio with lower cement content, a reduction in electrolytes are occurred to pass electric current. 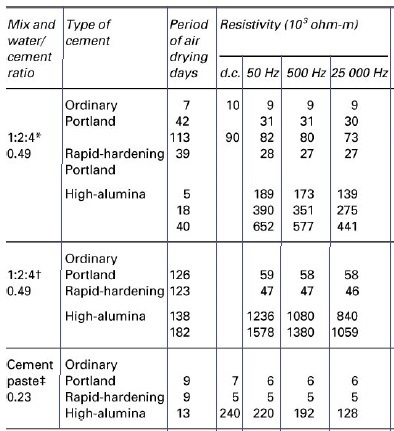 Table 3 provides some idea about influence of cement content and type on resistivity of concrete; here it is found that resistivity of concrete having high-alumina cement is 10~15 times more than ordinary portland cement, both having same properties. Electrical properties of concrete like resistivity or conductivity are important in some especial applications like railway sleeper or in some structures where concrete is designed to provide protection from divergent current. In railway signal systems, insufficient resistivity of concrete is not expected. These properties are also used in analyzing concrete properties in fresh and hardened state. Electrical resistance also have influence on on-going corrosion of steel embedded in concrete. Dielectric strength of any insulating material is the maximum electrical field which a material can counteract without failure i.e. sustain its insulation properties. 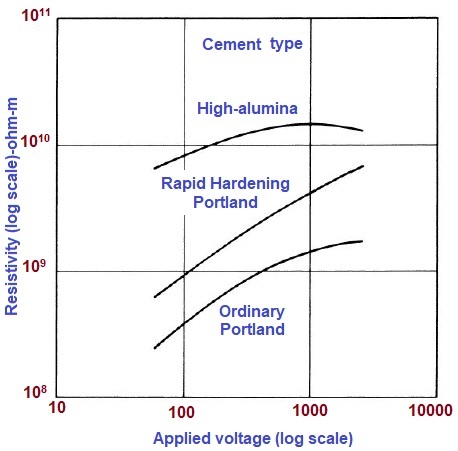 It was observed that dielectric strength of concrete with Portland cement is significantly lower than that have high-alumina cement. 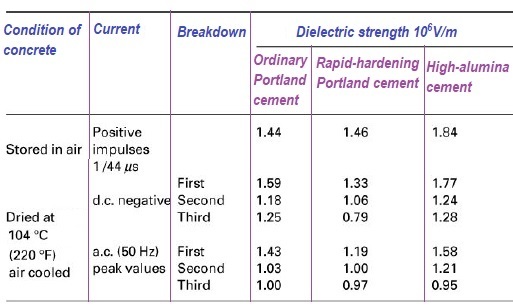 Table 3 shown dielectric strength of concrete. It can be concluded from the table that dielectric strength of concrete is not affected by moisture content; an oven dry concrete has approximately same dielectric strength as compared to that is stored in air (having higher moisture content).